Buying gifts for gamers can be hard. You never know what games they have and which they don’t. I don’t know many game players who aren’t interested in designing games as well. So how about thinking inside the box? 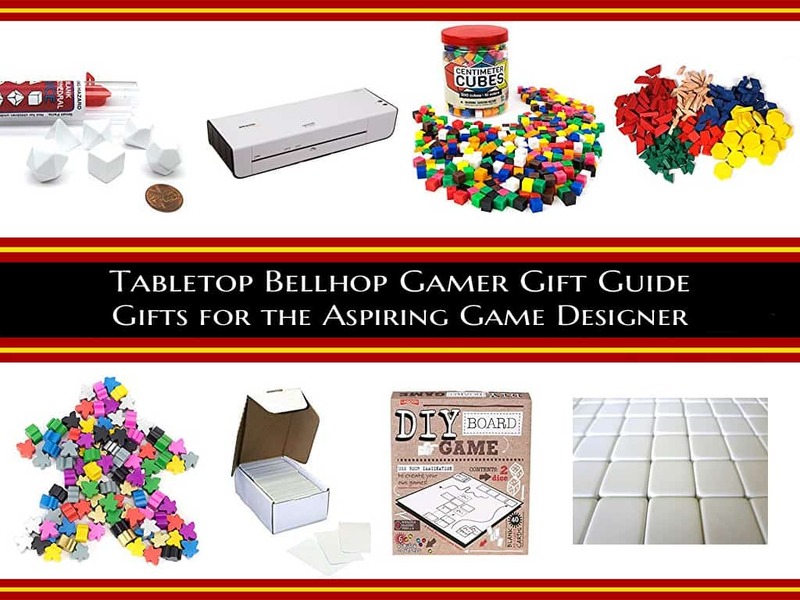 Here is a list of gift items that any aspiring game designer is sure to love. Whether they are an old school OSR GM or trying to create the next hit board game, like Ticket to Ride. Disclosure: Some links in this post are affiliate links. As an associate, I earn from qualifying purchases. A laminator is the gaming tool you didn’t know you needed until you have one. Or you show up to game night and game with someone who owns one. Laminated character sheets that can be filled out with dry erase markers. 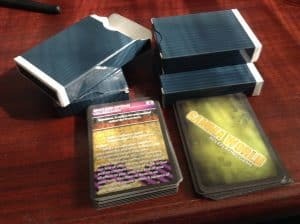 Plastic coated player aids listing all the actions available to players each turn. Actual coasters that remind you of the table rules (no Cheetos!). Paper miniatures that stand up on their own. Hex and counter unmounted boards that won’t warp. Chits and components you don’t have to worry about spilling your beverage on. So many possibilities. You can get both high end and low-end laminators. For most people, something like the AmazonBasics Thermal Laminator will do. If you want to do thicker laminate sheets or sheets larger than 8.5×11 you may want something fancier like the Scotch Advanced Thermal Laminator, Extra Wide 13-Inch Input, 1-Minute Warm-up (TL1302VP) . Whether you put stickers on them (some blank dice come with them), paint them, engrave them, or whatever, blank dice are great for trying out various custom dice configurations. There is this pack of 50 dice I’ve been sharing on Tabletop Gaming Deals for months now: Nakimo 16MM Blank White Dice for Board Games, DIY, Fun, and Teaching . There is also a great set of 6 D12 that come with stickers: White D12 Blank 25mm Dice Set with Stickers . For you RPG fans you can get a standard set of RPG polyhedrals as well: Polyhedral RPG 6-Dice Set ~14 to 19mm Tall – Blank White . This was something I didn’t even know was out there originally. You can get blank mounted game boards. They come in a variety of sizes, like your standard two-fold monopoly board: Apostrophe Games Blank Game Board or you can also get the four-fold style board that we usually see in hobby games: Folding Blank Game Board with Blue Pebble Cover . They are both surprisingly cheap. For a bit more money you can get the Lagoon DIY board game box that includes reusable board and wipeable markers: DIY Board Game – Make Your Own Game Board Kit by Lagoon . 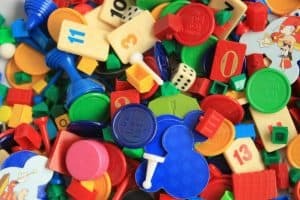 The one component every modern Euro game must have is meeple. 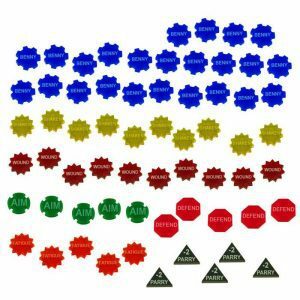 You can get a set of 100 cheap from Brybelly: 100 Assorted Wooden Meeples, Full 16mm Size . You prefer minis? That’s cool. While finding cheap minis could be a whole other post, you can get sets of blank standees with coloured stands for a very reasonable price: Value Pack of 12 – Blank board game stand-up player pieces with multi-color card stands. You can’t forget about the traditional pawn. Etsy is a great place to find vintage pawns at a great price. Like this set of 35 for under $10. A bit back I found this interesting set of 250 wooden bits. They come in six or so different colours and are unique shapes. Diamonds, hexes, triangles, trapezoids etc. I couldn’t help but think that these would be great for representing a variety of different resources or track different currencies in a game: hand2mind Wood Pattern Blocks (Set of 250) . I’ve also seen a variety of wooden discs out there like these: Creative Hobbies Round Unfinished 1.5″ Wood Cutout Circles Chips . And check out this set of 15 Multicolour Wooden Game Pieces on Etsy. For when you want something a bit nicer than index cards, you can grab this set of 500 cards for under $10: Blank Playing Cards . Now you won’t get 500 of them but you can get sets of Dry Erase Index cards that I think are brilliant for use in RPGs but that others have told me are awesome for prototyping: Apostrophe Games Dry Erase Index Cards . It’s surprisingly cheap to actually get your own set of cards printed. I personally have had great luck with Artscow. They are designed for printing a standard deck of 54 playing cards but you can put whatever you want on them, front and back. People have been using them for some time. Here’s an example of Trait Cards for the Gamma World RPG. Artscow also has frequent sales where you can get three decks for the price of one. Back when I ran 4th Edition D&D regularly, I found LIKO Aerosystems. This is a company that laser cuts acrylic and produces a ton of tokens and counters. I actually contacted them about making some custom components for playing 4e and they actually now sell those designs on their site. They did so well selling stuff for tabletop games they changed their name. You can get a huge variety of counters in different shapes and sizes. They even do some interesting 3d stuff. They aren’t cheap, perhaps something to consider when you are actually showing off your new game. LITKO Game Accessories. Looking for a bunch of bits cheap or not sure exactly what you need? 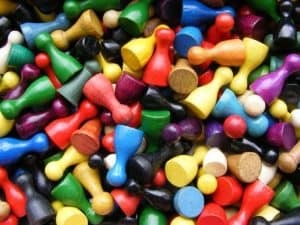 How about a grab bag of board game pieces. I came across this on Etsy and thought it was pretty cool. 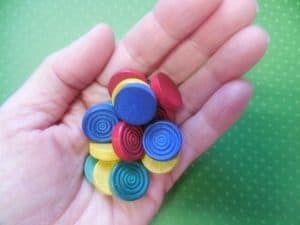 This is a set of 100 random vintage game tokens and markers for under $5.